Several years ago, when I was a newbie vegan blogger, I started following a blog called This Rawsome Vegan Life. I was in awe of this girl who was creating raw recipes and fabulous desserts. Over time I watched her photography develop to a extremely professional standard, her writing became more personal and captivating, and the food just kept getting more pornographic mouth-watering. 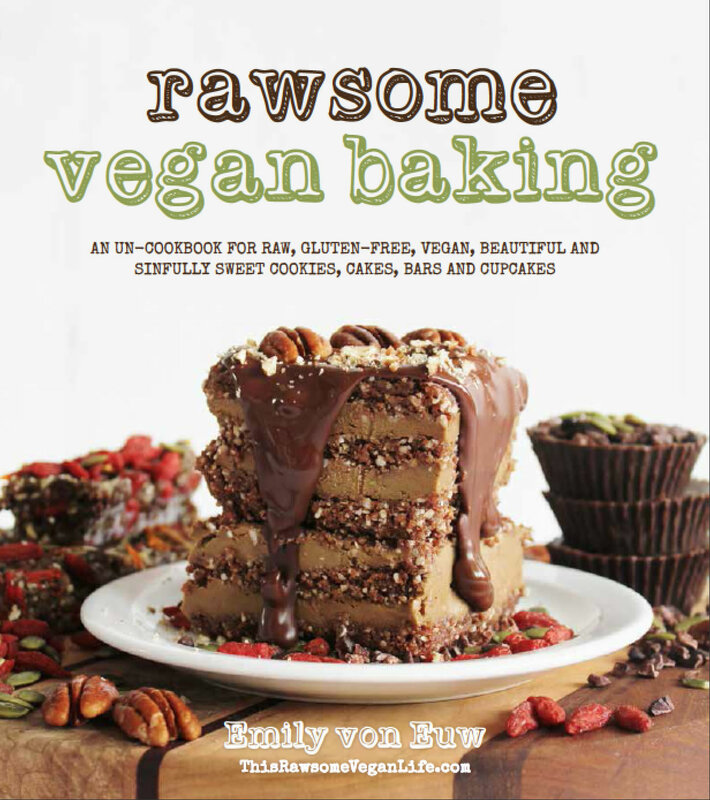 Now look at her – Emily’s a vegan author and practically a superstar! 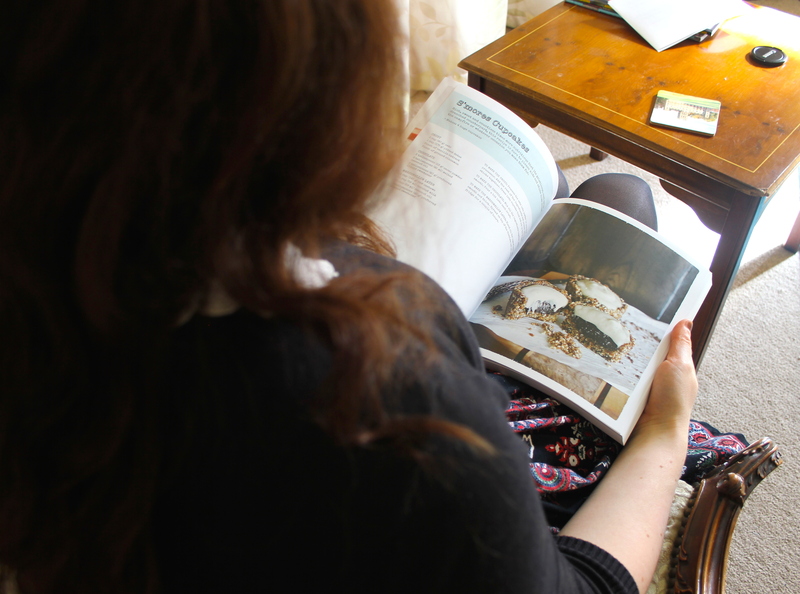 As soon as I got her book in the post I tore open the package and sat down to flick through my brand new book. As gorgeous cookbooks go, this one is an absolute show-stopper: every recipe is accompanied by a full-page photo (which I love; there is nothing worse than a recipe without a photo of the final result) and all the photography is done by Emily herself. Pretty accomplished for a twenty-year-old student. S’mores Cupcakes. I haven’t had a chance to try this recipe yet but HOLY MOLY I CAN’T WAIT TO. 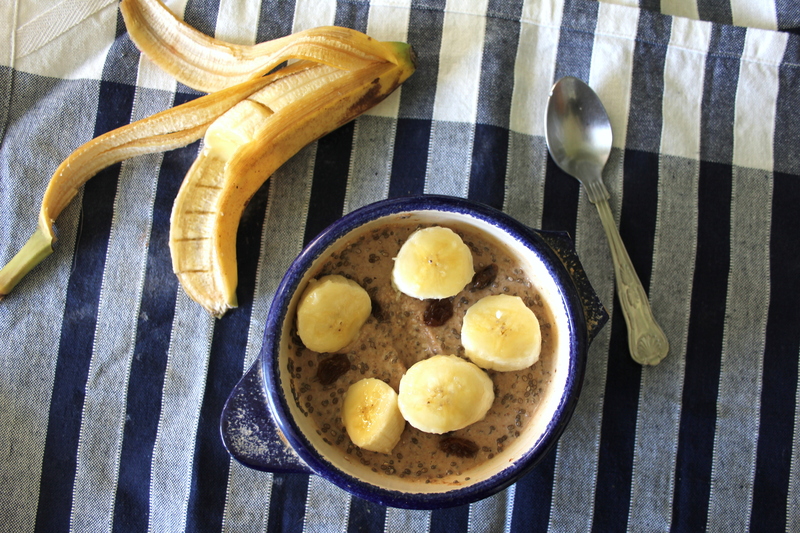 I tried the Chia Vanilla Raw Pudding with Raisins and Cinnamon for breakfast and topped it with sliced banana. So filling and simple to make. 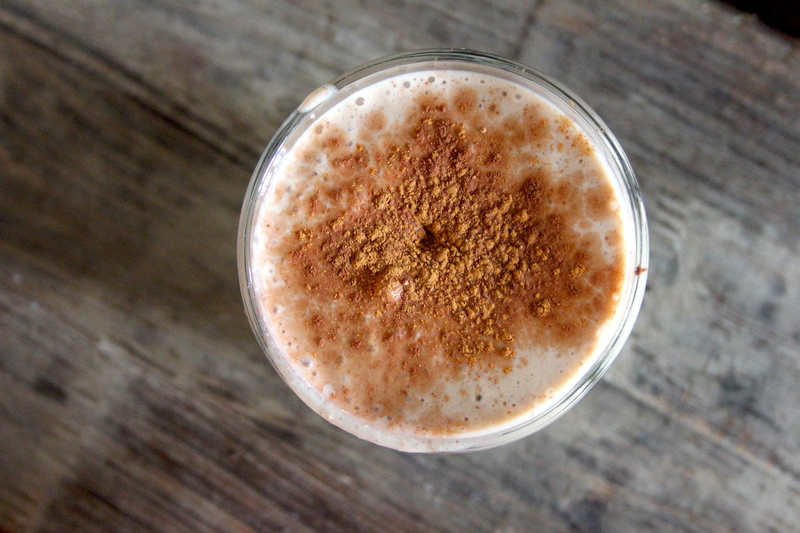 I would happily try this again for a healthy snack, though I would add chocolate if I was making this for dessert. 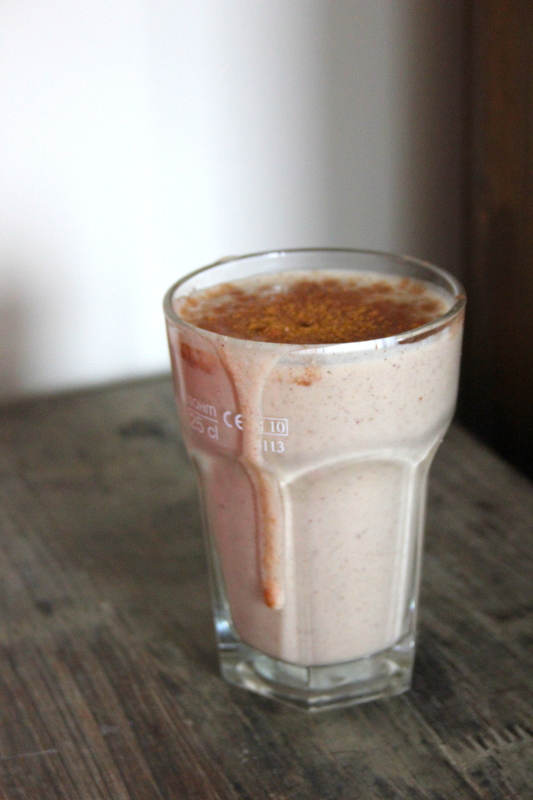 Another recipe I tried was the Heavenly Banana Date Shake, which rightly deserves its name. Is it breakfast, is it pudding? Who knows, who cares – it is delightful. At first I was a little stumped to see there was only a teeny tiny introduction – most cookbooks I have come with a fat chapter on kitchen equipment, cooking methods, tips and tricks… but then I almost laughed at the obvious answer: Emily’s recipes are so simple that they don’t need a big introduction. This book is truly for beginners and experts alike. The focus is on the food, with nothing unnecessary to clutter up the book. To be honest, I wish more cookbooks were like this. Emily and her publisher are very kindly sharing this gorgeous recipe for Ice Cream Sandwiches with Rosemary Almond Cookies. It looks to die for! I could eat all of these in one sitting, no kidding. This recipe has four ingredients (or five if you add rosemary). I love how simple and filling raw desserts are: there are no lame filler ingredients, such as flour, baking soda and sugar. Every single component of these recipes is a whole food, special and delicious on its own. You wouldn’t snack on flour while baking, would you? Or grab a few tablespoons of sugar when making ice cream, right? Those ingredients are too refined to be good on their own. In my recipes, I like using only foods that are awesome all by themselves. Get messy with these bad boys. TO MAKE THE COOKIES: Process all the ingredients in your food processor until they stick together. Press half of this cookie mixture into the bottom of a parchment paper–lined baking pan, so it ends up being about 3⁄8 inch (1 cm) thick, or however thick you want your cookies to be! Put in the fridge. TO MAKE THE ICE CREAM: Put the fruit into your high-speed blender and blend for several minutes, continuing to push the fruit into the blades. In just a moment, the frozen fruit chunks will turn into a creamy thick soft-serve ice cream. Spread this onto your bottom cookie layer and put it back in the freezer until it’s solid. Then press the rest of your cookie mixture on top. Again, put in the freezer until totally solid. Cut out cookies with . . . cookie cutters (duh). Nom nom nom! Disclaimer: I was provided with a review copy courtesy of Page Street Publishing but as always all opinions are my own. I love ogling over Emily’s gorgeous pictures! Great that each recipe has its own photo. I can’t really do a lot of dried or sweet fruit which means most of the recipes are out unfortunately.